Purchased a house with a 900sgft deck that has Flood solid color deck & siding acrylic stain on it. I started to strip a test section with Olympic stripper & power washer I purchased from Home Depot. I reapplied 3 times & it removed maybe 60-70% of top stain. I also noticed it looks like there may be a translucent cedar colored stain under the solid acrylic stain. I'm looking for product(s) to effectively remove both & then restain with TWP 1500 series stain. Or would I be better off sanding the entire surface? Better off sanding to remove solid colors. I have cedar decks that were stained years ago, but I don't know which product was used. Is there a way to determine if the stain is water-based or oil-based? No not really except water based tends to peel more. Either way you have to remove the old coating if you plan on using TWP. We have several coats of wood guard Honey 2000 on our log home. We pressure washed lots off the wood surface, but it isn't as light as we would like. Do you think the safe strip would lighten it further? We don't want to use something caustic. We tried to put sickens clear over the cleaned logs and it made them darker again. What would you suggest as far as stain to keep the logs as light as possible? Yes you can use this over water. Can this be used on a boat dock, over water? You cannot spot remove the thick areas. You would need to strip the entire deck done. You could also try to wipe down the thick areas with lacquer thinner to remove the excess. I recently had my deck coated with TWP 1500 and in a few places the stain was applied too thick on the first coat and now will not dry. It is also starting to peal in a few places. What should I do to remove the stain that will not dry? Best to use the Restore A Deck Stripper followed by the brightener. It will strip it more effectively. 6-7 Gallons of Stain for 2 coats. 5 gallons for 1 coat. I have a 650 square foot cedar deck that was last stained 5 years ago with TWP semi tranparent Cedar stain. A lot of it is worn off,and I am going to refinish. I assume I will need to strip the existing stain so will 1 gallon of the Safe stripper do the job? Then do I need to use a brightner? I plan on using 1501 Cedartone stain. What amount of cleaner, brightner, stain will I need to do a 650 square foot deck? Use the Restore A Deck Stripper then the RAD Brightener for the prep. I want to use the TWP 1500 on my cedar deck that is 13 yrs old and currently stained with Cabots Semi-Transparent stain. What steps do I need to do to ready for the new TWP 1500? Was planning on using the Safe Strip, power wash, then apply new stain but do I need to use a brightner before staining? Stay with the same. 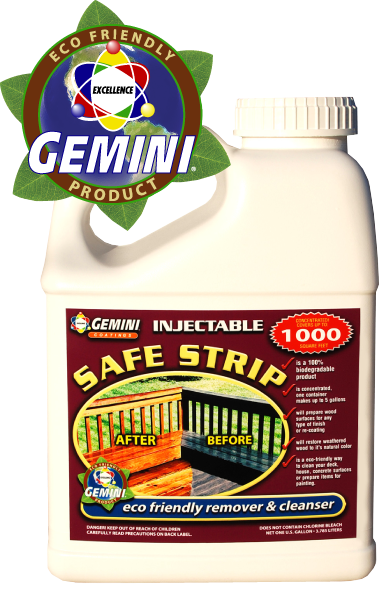 Use the Gemini Restore kit for the prepping. Built deck 4 years ago with AC2 treated pine. We applied TWP 116 rustic oak 3 years ago. Our deck faces south so it gets a lot of brutal sun and lots of Missouri weather extremes; it is ready for a refinish. Stain color is worn off in some parts but still present mostly and especially present under house soffit but water no longer beads. Facia boards are the same...color is present but water no longer beads. What is your best suggestion for prep and application this year? Also, do we use the same product or use 1500 series? Thanks! can this stripper be used to remove a oil based stain from a white pine log home? Sandy, TWP clear offers no UV protection from graying. You must have a tint in your TWP. If you are okay with that then you can use the clear. If the wood is cleaned and free of other coatings then it is probably ready to go. What is the total sq. footage? 15 year old pressure treated pine deck in good shape- used Olympic water based sealer (clear) about 3 years ago - pressure washed & used tsp & bleach & scubbed and rinsed it well today. Can I wait for drying 48hrs and start applying? or do I need to do further prepping? if so, what do you suggest and how much will I need? Strip off the Cabot with the Restore A Deck Stripper followed by the Brightener. Once done, stain with the TWP 100 Series.